A big warm welcome today to all and especially those who have just hopped over from Karen’s brilliant blog, Well I Guess This Is Growing Up. Thank you, Karen for sending readers my way! 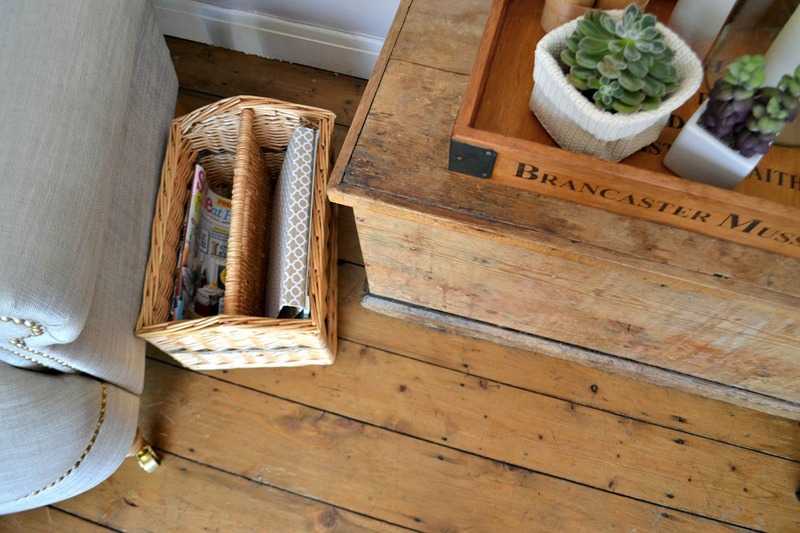 If you didn’t know, today is my turn to share my home style as part of the #UKHomeBlogHop which was launched on Monday by our wonderful host, Kimberly at Swoon Worthy. 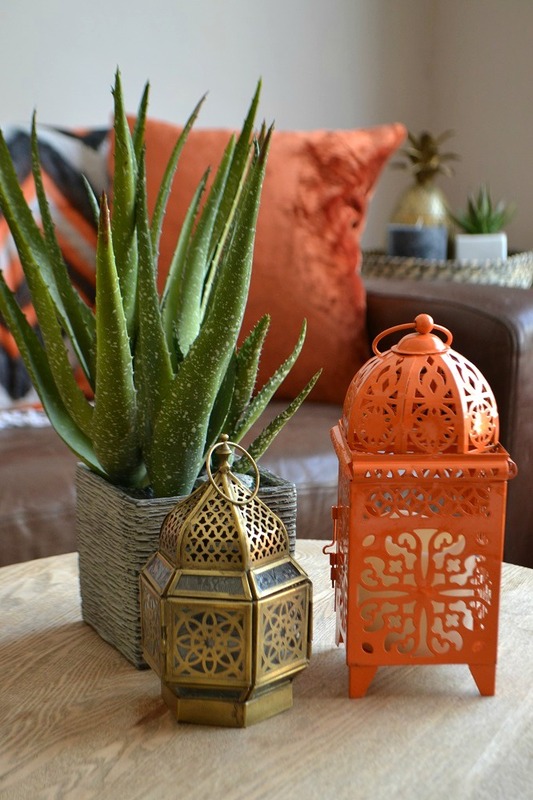 A total of 27 home interiors bloggers have taken part in all, inviting you into their homes and outdoor spaces to reveal their secrets for adding gorgeous summer touches to patios, balconies, living rooms, dining rooms and bathrooms. 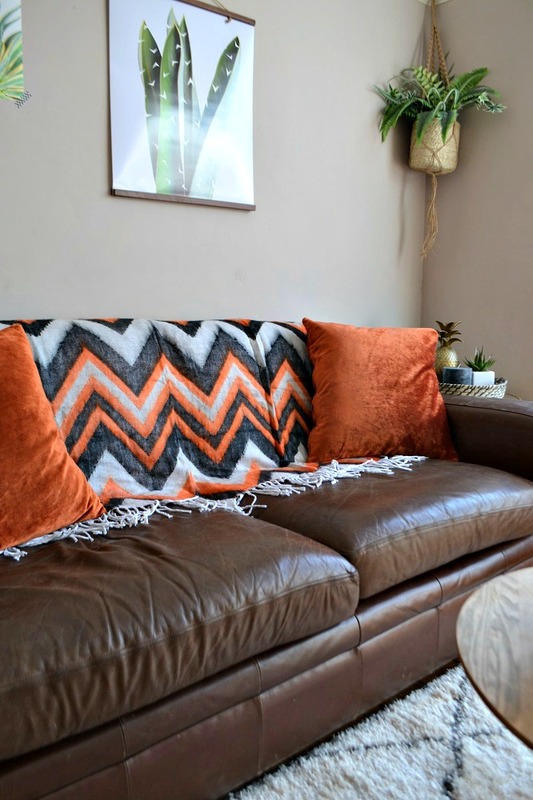 For anyone who doesn’t know me, I’m Antonia, a 40-something wife and mum of 3 boys and my home interiors & lifestyle blog has just celebrated its 5th birthday. 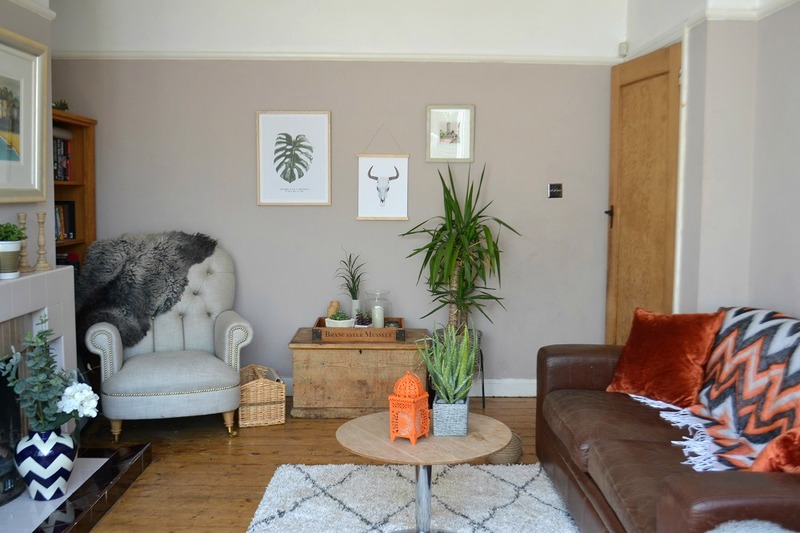 I’m nutty about home design which means our 1930s 3-bed semi in South Manchester is always in a state of flux – being primped, preened and painted frequently as I love trying out different interior styles and trends! 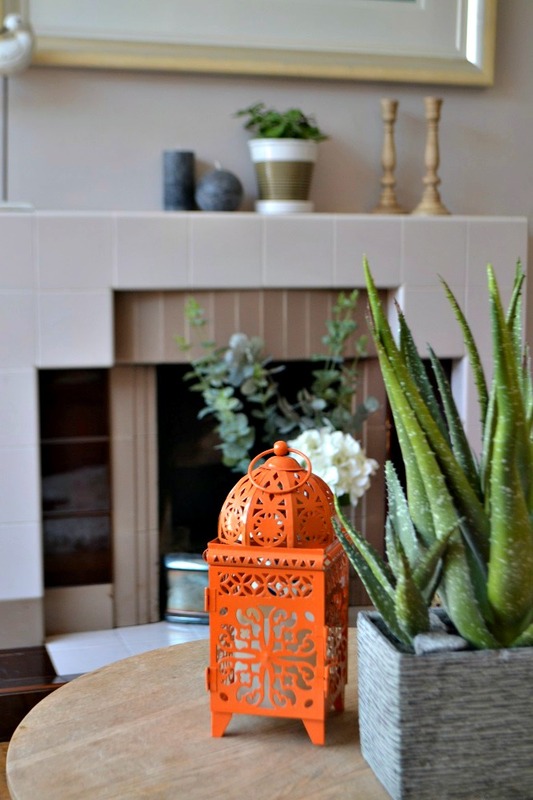 With so many great decor ideas on show with the #UKHomeBlogHop, I hope you’ll get chance to check them all out; I’ve added a list of all the blogs at the end of this post to make it easier. 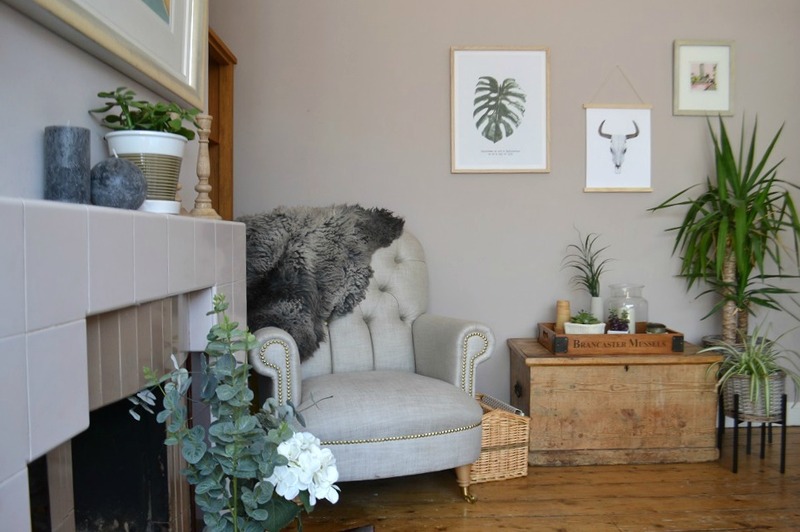 I’ve shared our dark blue front room quite a bit on the blog and Instagram, but haven’t really revealed too much of this back room before – it is more of a family room that leads into our conservatory. Bigger, lighter and brighter, but it was a little bland if I’m honest and lacking decorative touches. Fortunately I’ve had some great sponsors work with me on this post to improve the room greatly which you’ll see as we go along – shout out to Wayfair, Johnstones Paint, Sweetpea & Willow, Posterlounge, The Rugseller and The Basket Company for providing some great accessories, some of which you’ll have a chance of winning in a follow up post coming soon! Our old fireplace is the original 1930s one and quite shabby now, unfortunately. When we moved in here 12 years ago it had a few broken tiles which my dad replaced with the teapot brown ones, but some of those are now chipped and cracked so I would love to put a wood burning stove in here in the future. 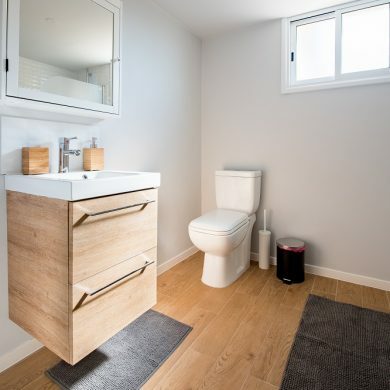 Called ‘Chapel Stone’ from Johnstones Paints, its a warm neutral shade that just seems to work in this room. 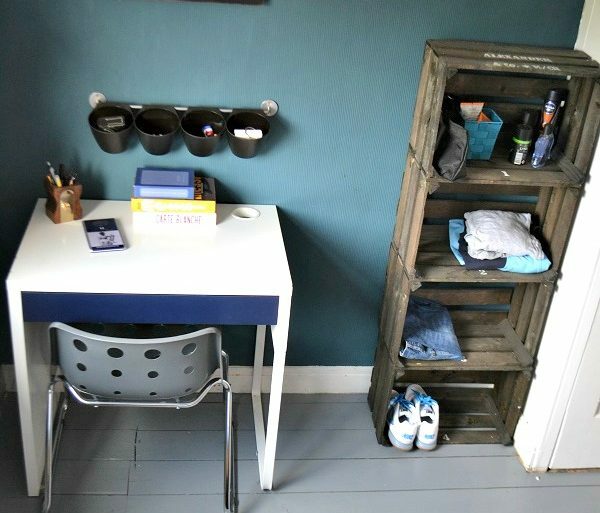 We’ve tried pure white, teal and a lemony-green and none has suited the walls as well as this, so we’re sticking with it. 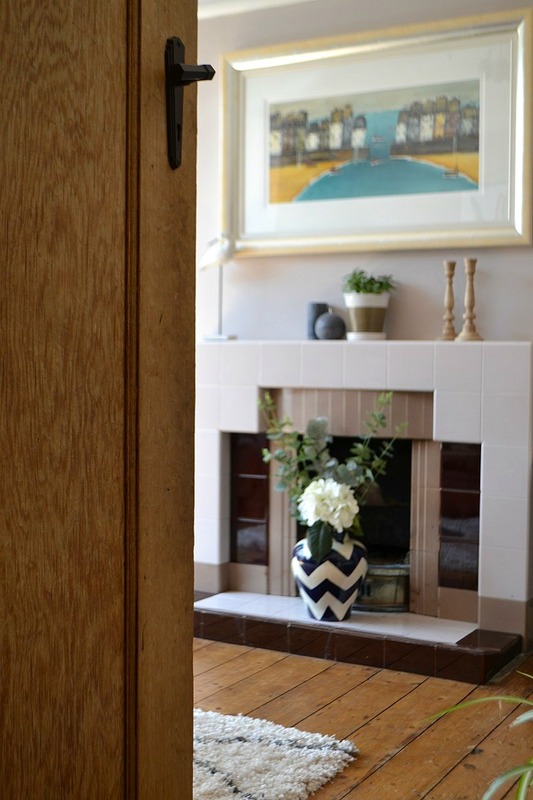 What’s more, the matt emulsion formulation is washable, which is perfect for a well used family room. 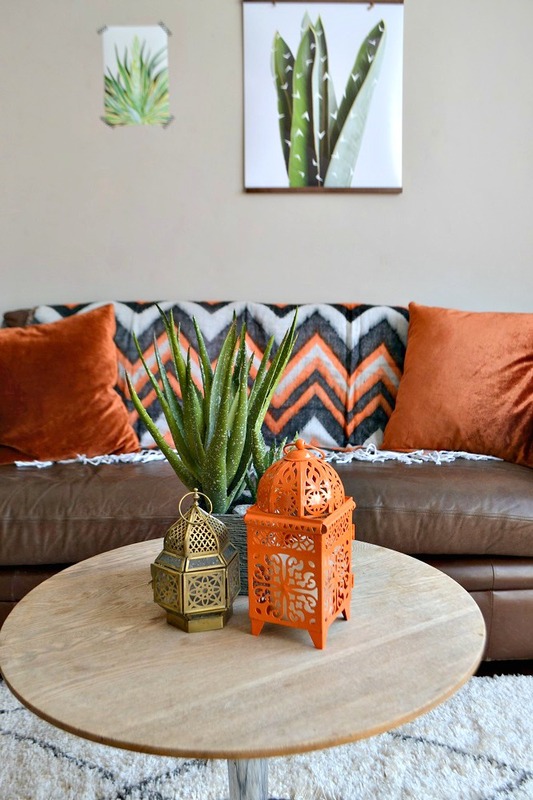 I don’t know about you, but I’m loving all the current bohemian interiors and wanted to try and capture a little bit of that mood in our room, so the Zig Zag Throw and gold Metal Lantern from Wayfair are both ideal – I love the vibrant orange in the throw, it gives me 1970s vibes and that boho feel I was after. Above the sofa are a couple of fab posters from Posterlounge, making great wall décor accents in here. Don’t you love the hanging poster frames too? Also from Posterlounge, they are really inexpensive compared to some similar frames on the market. 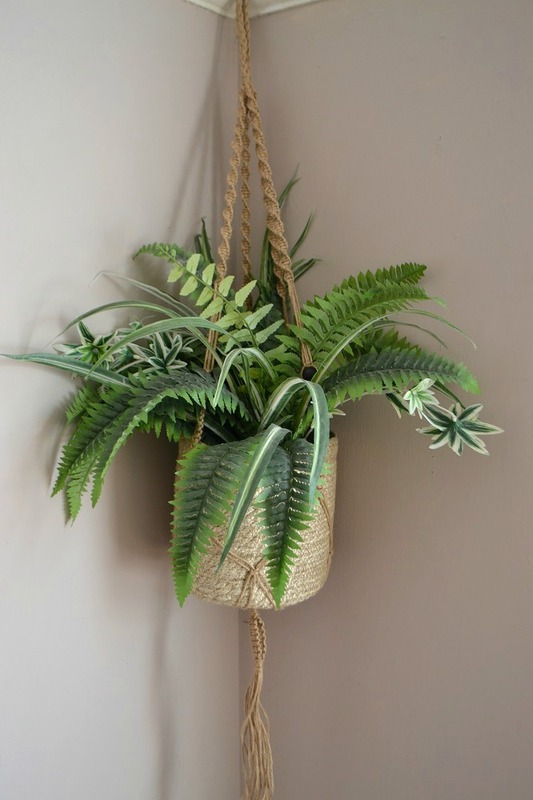 I am also totally in love with my macramé style planter, the Lene Bjerre Judith Hanging Flower Pot from Sweetpea & Willow – I’ve been coveting one of these forever, so its great to finally get my hands on one and I already had a faux plant that fits perfectly inside and no watering required! 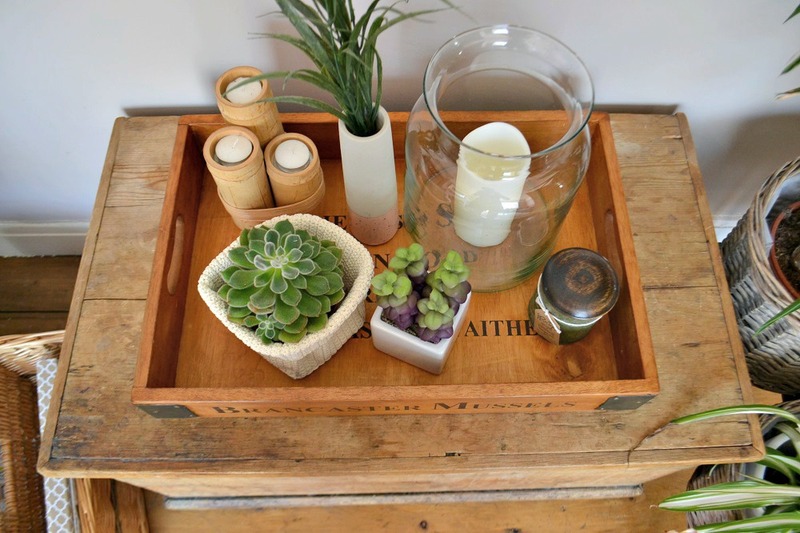 Also from Sweetpea & Willow is the faux potted plant on the table which is very realistic looking – definitely one of the best fakes around. 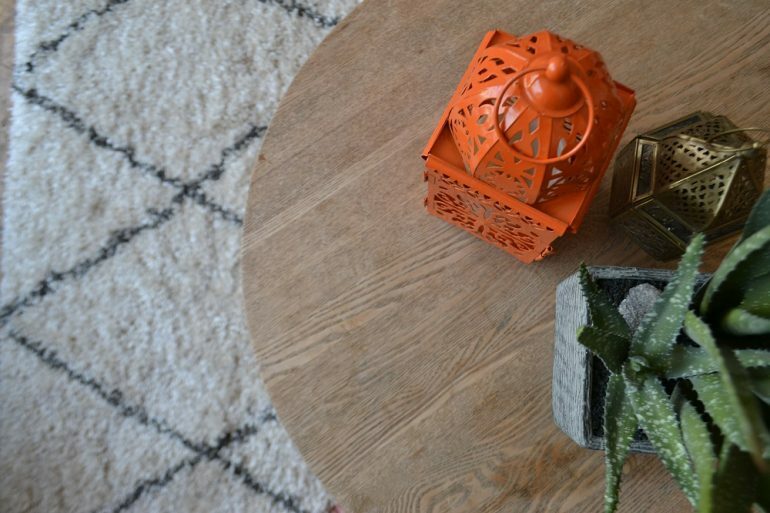 No Boho living room is complete with an ethnic rug and mine takes inspiration from the popular ‘Beni Ourain’ handcrafted rugs. 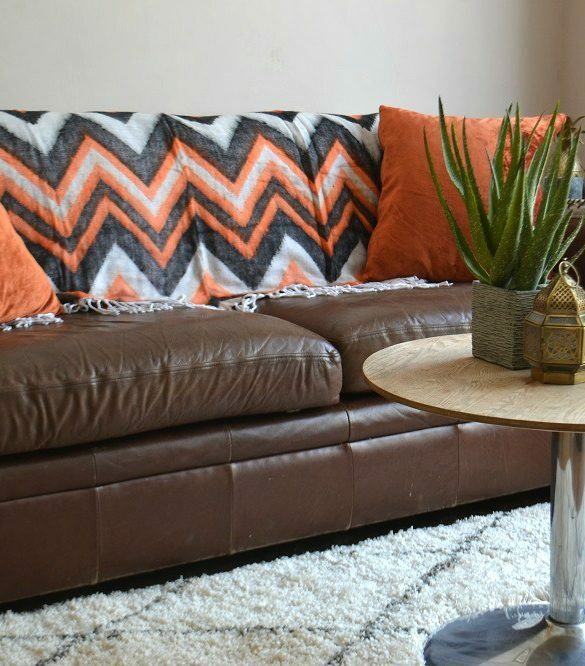 From The Rugseller, you might have seen that I have the grey version of the Logan Rug in our front room and because I love it so much I was keen to try the cream version with grey design. The grey rug has proved so easy to look after and keep clean it’s a total winner, so I’m certain this one will be no different. 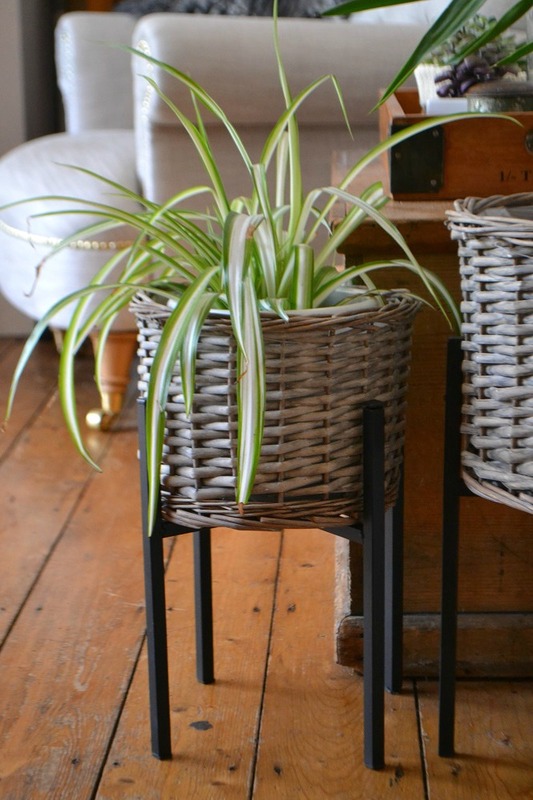 Other accessories in the room include a pair of grey wash wicker round planters and stands with black metal legs, a wicker magazine holder and a gorgeous market vintage style wooden tray, which is fantastic for holding plants, candles and eclectic items, all from The Basket Company. 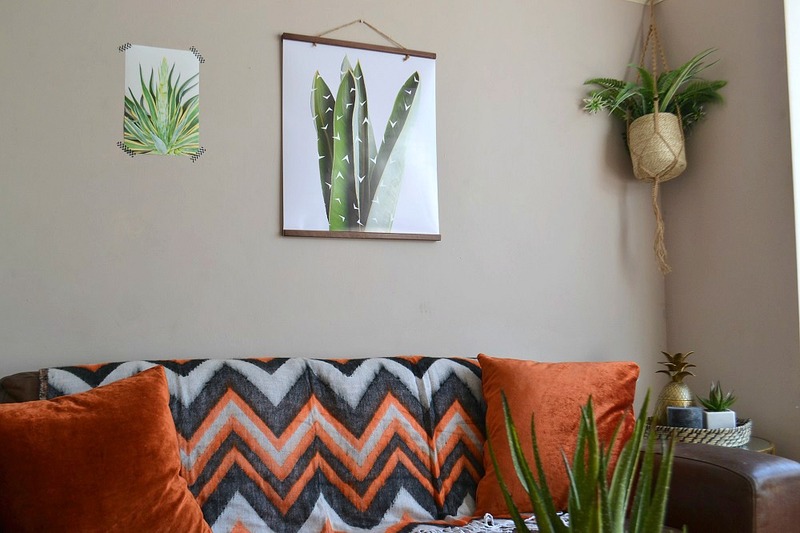 It’s always nice to give your home a little seasonal refresh and so I hope you enjoyed this glimpse into my room and maybe given you a few ideas for your place? Don’t forget you’ll get a chance to win some of these featured items in a giveaway post following soon! 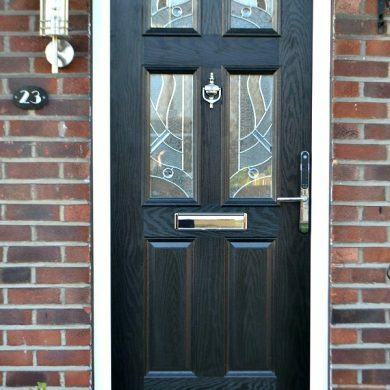 Thanks once again to Kimberly at Swoon Worthy for organising another stonkingly good #UKHomeBlogHop and all the fabulous sponsors that got on board with us and helped make the posts what they are! So this is where I would normally hand over to the next person in the blog hop, but my post is actually the very last stop on the tour (boo! 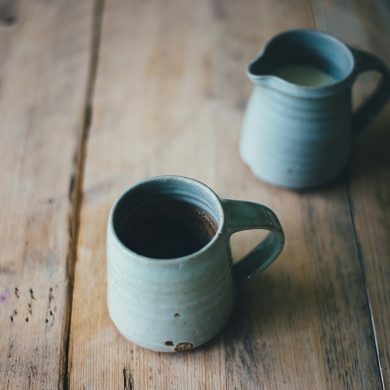 ), so instead I would recommend you head over to the start of the blog hop here and make your way through all the wonderful posts that precede mine at your leisure. 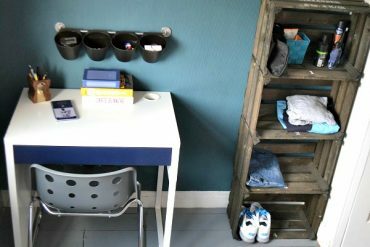 Tidy Life – that’s me! This space looks so relaxing, I really like it. I like that you have added a splash of colour, and the greenery of the plants is a great contrast. Great post! I can’t believe that aloe plant is fake! Looks stunning. Are the eucalyptus branches fake too? I always struggle to find them. i Love the pops of the vivid orange, looks fantastic! very cosy! i love the pops of the vivid orange, looks fantastic and a cosy place to sit! Orange is my favourite colour for this year! 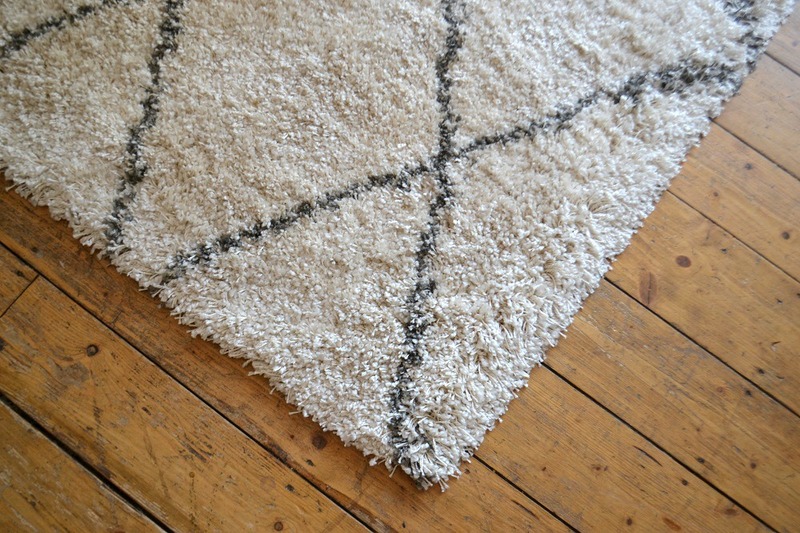 Love how you have mixed it in with all the other neutrals too! 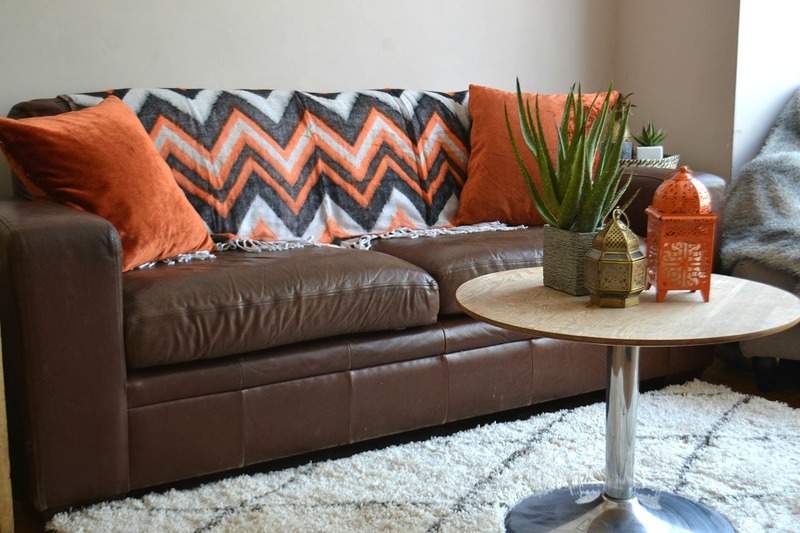 That orange throw really brings the summer to your sofa. What a great find. 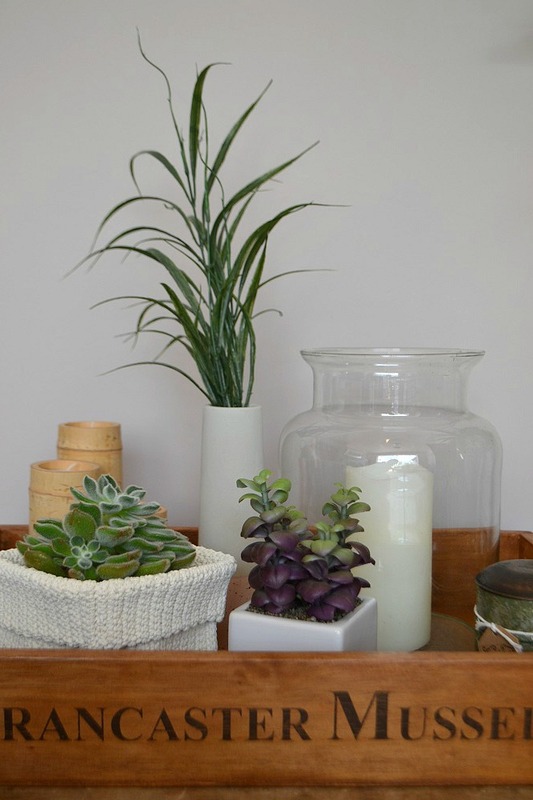 I love the relaxed feel of this room, and the plants of course!